It’s Fun! It’s Easy! We are ready to help you! A visit to our showroom here in Pennsylvania is the very best way to discover what a YesterTec kitchen can do for you. The images on our website simply do not compare to the impact of seeing three dimensional pieces of furniture up close. 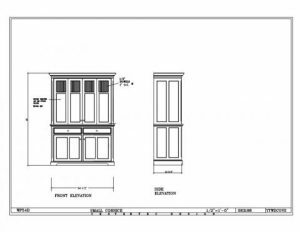 So, many of our customers from around the country have visited our showroom to select their workstations, but most have simply used our catalog, this web site and our design services to create their unique kitchen. Our showroom is available to designers and individuals on an appointment only basis. Simply call or email us to arrange an appointment. Designing with workstations usually generates many questions, so please call us, anytime! Though many of your questions can be answered by reading the information on this website, please do not hesitate to call – we want to hear from you! Email and texting simply cannot be used when discussing designs; there are just too many issues that need in depth explanation. However we do use email to support our telephone conversations. We do not text at all! By appointment only, we will help you create a room utilizing YesterTec workstations. The sessions can be accomplished in person or remotely. 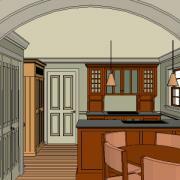 We can start with dimensioned sketch plans of your existing room that indicate all existing or proposed room features. Initial planning utilizes 2D techniques. Once the 2D planning is completed and preliminary price quotes have been approved, the design can be digitized and a plan and 3D computer generated design rendering of the design can be produced as noted below. Computer generated 3D color renderings are available for those who wish to view the design created above in 3D. Most of the design concepts that utilize our products can be modeled, but not all of the available options for our models can be graphically illustrated. An alteration to any YesterTec model listed in our catalog is considered a custom order. We welcome your ideas however and will try to accommodate your requests. Generally we can ‘ballpark’ price a custom piece quickly. Please call us to discuss your custom requests. We can quote starting and average prices for most of our pieces right over the phone for all customers. Exact price quotes for each piece are generated with our exclusive computer pricing system once all selections have been made using the catalog’s selection sheet process. During the contract stage, YesterTec Services will prepare 2D elevation drawings of each piece for your approval. Rough-in drawings are sent ahead so that the utilities that will be needed can be installed prior to the arrival of the kitchen pieces. We offer 2 types of Delivery Services. Curbside Delivery is when the order is removed from the truck and you are responsible for providing the labor to move the items inside. Inside Delivery is when a delivery crew brings the order inside. Typically, you will need a few people to move the pieces. Most of the workstations are larger than normal cabinetry so proper access routes need to be planned in advance. Truck access must be pre-determined as well. All deliveries are custom quoted once the parameters of the job are known. YesterTec does not provide installation services. However, installing them typically takes less time than installing cabinetry, but it is recommended that the installer is at least a handy man who is familiar with kitchen installations including coordinating electrical and plumbing services. That said, some homeowners with only a basic set of tools have installed their own workstations! Our workstations are packed with instructions that outline the required installation procedures. All workstation enclosures (workstations that enclose appliances) are packed with the installation procedures required for appliance installation. Please Note: The YesterTec Design Company will not be responsible for any design decision that is made resulting from any of our consulting services. Though we will strive to discover all the pertinent information concerning your project that can affect a final design, there are simply too many factors that affect the design that may not surface during any sort of consultation or service that we offer.